Hey guys, it’s midnight. I just got back from full day of TAAFI day 2. The day was really great. I’ll write quick summary of what was fun and unique about it. The first place I visited after I picked up my pass was the Animation Arts Maarket. That’s where some studios and artists had table set up for promotion and to sell cool stuff they made. Besides the great talents that had their table set up there, what really stood out for me was that the Maarket was free admission. Yes FREE. It almost sounds like no brainer but I’ve been to few festivals and conventions where the ‘artist alley’ was accessible for pass holders only. Paying entry fees just to spend more money never made sense to me. I’m glad Taafi agrees. My TAAFI event schedule mostly consisted of going to talks. The first one I sat in for was “Creating Bee and Puppy Cat” panel with Natasha Allegri moderated by Adam and Andrew from Guys with Pencil podcast. (photo above) This was very entertaining talk as Adam and Andrew got to do what they do best-having super casual conversation with their panelist. The audience got to take a peek into Natasha’s personality and really connect the creative mind behind the show and what makes Bee and Puppycat so unique. Apparently, ketchup chips make an appearance in one of the upcoming episodes on Bee and Puppycat. Jim Zub had more of instructional talk about how to work with a client at his ‘Playing in Someone Else’s Sand Box’ Panel. Though the bullet points seemed fairly obvious, backing it up with his personal experience stories definitely made it valuable to listen to. Stephen Silver gave talk on ‘How Not to Get Screwed’. If you’ve been following Stephen on the topic ever since he started spreading the message on the internet, it was similar talk but one can never hear it enough. To wrap up the day, The Nelvana Bouncing Ball party was held at Corus Atrium. More drinks and people to talk to, it was good way to wind down. There weren’t any bounding ball but there were half dozen storm troopers walking around. See you at day 3 tomorrow. 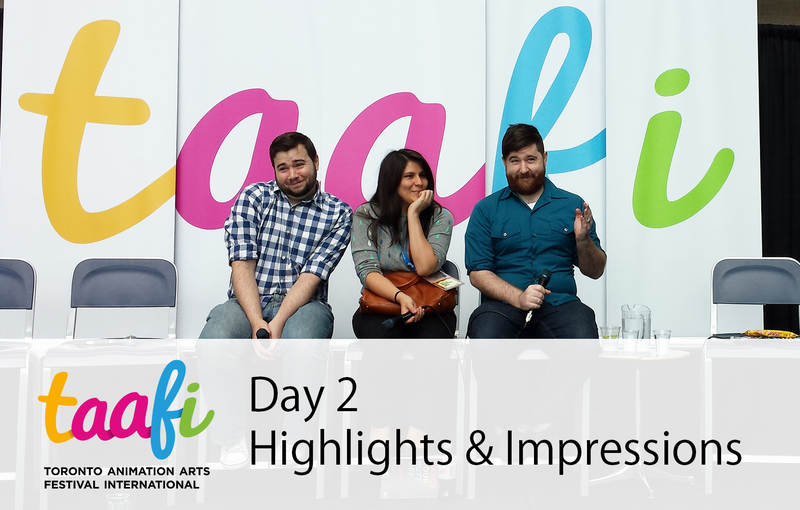 If you were at TAAFI, share us your experiences. I’m curious to know what I missed. If you had a table, I’d love to know how your day went as well. This entry was posted on Sunday, June 15th, 2014 at 1:08 am	and is filed under News. You can follow any responses to this entry through the RSS 2.0 feed.